Welcome to S’well wholesale application portal. We're eager to learn more about you and your company! Please have all your information ready, including a couple pictures of your store. It will take about 5 minutes to complete the application and we'll begin reviewing it right away. Interested in selling S’well? Please fill out the application below. Thank you for your interest. PRICING: All prices are wholesale and to the domestic trade only. Please coordinate with your sales representative or consult the most recent S’well catalog and order form on product pricings. CHANNELS OF SALES: S’well does not allow retailers to sell online, except with explicit written permission. S’well bottles may only be sold at locations approved in writing by S’well. 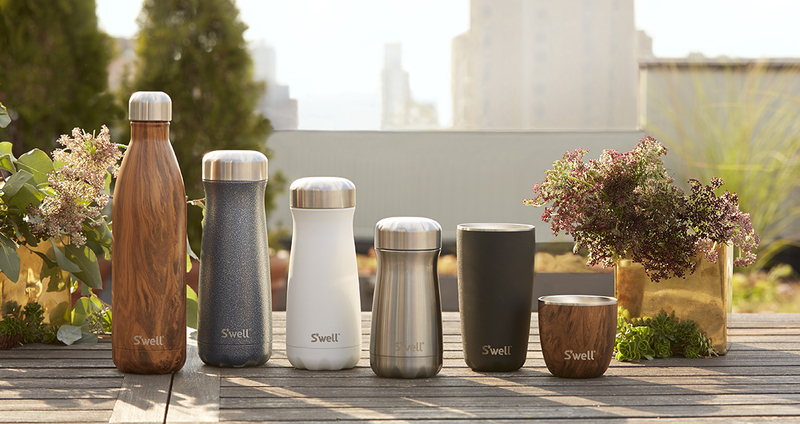 S’well bottles may only be sold direct to consumers and not to third party distributors. NEW ACCOUNTS: First time minimum order is $500.00 USD. Products must be ordered in case quantities of four (4). A completed retailer application must be submitted through wholesale.swellbottle.com/application/. New accounts will be opened at S’well’s sole discretion based upon market conditions and other factors deemed relevant by S’well. Each individual resale location must be approved by S’well. Please allow up to 2-4 weeks for a reply, response time may vary seasonally. ESTABLISHED ACCOUNTS: Minimum reorder is $175.00 USD. Products must be ordered in case quantities of four (4). Minimum account maintenance is $2,500.00 annually. If annual volume is not reached the account will become inactive. INACTIVE ACCOUNTS: Previously established accounts that have not met the minimum annual maintenance or have not placed a re-order within 3 months of last order will become inactive. To be reinstated, inactive accounts will be subject to reassessment and may be reopened at S’well’s sole discretion. CUSTOM ORDERS: S’well reserves the right to approve or deny any customization to S’well bottles which includes but is not limited to printed logos and etching. For more information contact custom@swellbottle.com. INTERNATIONAL ORDERS: All international sales for resale are managed by S’well. U.S. retailers are strictly prohibited from distributing outside the U.S.
PAYMENT TYPE: Merchandise and applicable freight charges will be invoiced when order is processed. We require pre-payment by credit card for the first 3 orders, after which Net 30 terms are available upon credit approval. We do not accept C.O.D. orders. Customers who pay by credit card will be charged at the time orders are sent to the warehouse for processing. Accounts will be emailed a receipt once the order is paid, which will indicate that the warehouse is processing/packing the order to prepare for shipment. Processing time can vary per order. PAYMENT TERMS: A $30 fee will be assessed for returned checks. We reserve the right at any time to suspend or change credit terms provided if your account standing becomes past due. A failure to pay invoices when due will make all subsequent invoices immediately due and payable irrespective of terms. Additionally, S’well may withhold all subsequent deliveries until the account is settled in full. For any invoice inquiries and requests contact ar@swellbottle.com. ORDER PROCESSING TIME: For orders in stock, the average processing time is 5-10 business days. Any changes or edits to an order will be considered by your S’well representative but no adjustments are guaranteed. BACKORDERS: If an item is not in stock, it will go on backorder and be sent out automatically when restocked. The buyer is responsible for canceling backorders if the item is no longer required. For order edits, please contact wholesale@swellbottle.com. Refused merchandise will incur freight and/or storage charges in addition to a 10% restocking fee. SHIPPING: U.S. orders ship via UPS Ground. Freight charges apply and will be added to invoice upon processing. Please provide any special shipping instructions or guidelines at the time the order is placed. Buyer shall be responsible to file damages with the carrier for the unlikely and unfortunate event of damage occurred in transit. CLAIMS & RETURNS: All claims for exchanges or returns must be made within 14 days of receipt of goods with photographic evidence. Merchandise purchased for future use must be inspected upon receipt. Accepted claims and returns of S’well products include any evidence of damaged goods on arrival or a false shipment. Failure to make a claim within the stated time constitutes acceptance of the goods as is. No returns are accepted without authorization from a S’well representative. Retailer must submit the S’well damage form and photos through the S’well wholesale portal in order to file a claim. Retailer is responsible for reporting/filing claims on behalf of their customer. otherwise advertises, promotes, offers for sale, or sells S’well products. Retailer agrees that it will not purchase S’well products from any source other than from S’well. COMPLIANCE WITH LAWS. S’well will be solely responsible for complying with all laws with respect to S’well’s fulfillment and shipping of orders and the offering of S’well’s product for sale in-store and online. In addition, S’well will timely notify Reseller in writing if any such law impacts, in any way, Reseller’s ability to advertise, market, sell or distribute any product handled by S’well or otherwise impacts S’well’s performance under this agreement. ASSIGNMENT. Reseller may not assign, delegate, or otherwise transfer to any entity any of its rights or obligations under this agreement or under any order without S’well’s written consent. For purposes of and without limiting the foregoing, a change of control of Reseller will be deemed to constitute an assignment (or purported assignment) of this agreement by Reseller. LIMITATION OF DAMAGES. IN NO EVENT WILL EITHER PARTY BE LIABLE TO THE OTHER PARTY FOR ANY PUNITIVE, SPECIAL, INCIDENTAL OR CONSEQUENTIAL DAMAGES OF ANY KIND (INCLUDING BUT NOT LIMITED TO LOST PROFITS, BUSINESS REVENUES, BUSINESS INTERRUPTION AND THE LIKE), ARISING FROM OR RELATING TO THE RELATIONSHIP BETWEEN S’WELL AND RESELLER, INCLUDING ALL PRIOR DEALINGS AND AGREEMENTS, OR THE CONDUCT OF BUSINESS UNDER OR BREACH OF THIS AGREEMENT OR ANY ORDER, CANCELLATION OF ANY ORDER OR ORDERS OR THE TERMINATION OF BUSINESS RELATIONS, REGARDLESS OF WHETHER THE CLAIM UNDER WHICH SUCH DAMAGES ARE SOUGHT IS BASED UPON BREACH OF WARRANTY, BREACH OF CONTRACT, NEGLIGENCE, TORT, STRICT LIABILITY, STATUTE, REGULATION OR ANY OTHER LEGAL THEORY OR LAW, EVEN IF RESELLER OR S’WELL HAS BEEN ADVISED BY THE OTHER PARTY OF THE POSSIBILITY OF SUCH DAMAGES. PROVIDED, HOWEVER, THE FOREGOING WILL NOT LIMIT THE SPECIFIC RIGHTS AND REMEDIES EXPRESSLY PROVIDED IN THIS AGREEMENT. FORUM SELECTION; CHOICE OF LAW; STATUTE OF LIMITATIONS: This agreement, and any and all disputes arising under this agreement or relating hereto, whether sounding in contract or tort, will be governed by and construed in accordance with the laws of the State of New York without regard to the internal law of New York regarding conflicts of law, and the federal and/or state courts in New York will have exclusive jurisdiction over any actions or suits relating thereto. The business relationship between S’well and each reseller is “AT WILL;” that is, S’well is free at any time to choose those with whom it wishes to deal. The parties hereto expressly understand and agree that each party is an independent contractor in the performance of each and every part of this agreement, is solely responsible for all of its employees and agents and its labor costs and expenses arising in connection therewith. Neither party nor its agents or employees are the representatives of the other party for any purpose and neither party has the power or authority as agent, employee or any other capacity to represent, act for, bind or otherwise create or assume any obligation on behalf of the other party for any purpose whatsoever. Moreover, both parties reserve the right at any time to terminate the relationship for any reason whatsoever without penalty upon at least with 30 days’ advance written notice to the other party. This agreement may not be modified without the express written consent of both parties. ENTIRE AGREEMENT. This agreement and any order constitute the full understanding of the parties, a complete allocation of risks between them and a complete and exclusive statement of the terms and conditions of their agreement. All prior agreements, negotiations, dealings and understandings, whether written (including any electronic record) or oral, regarding the subject matter hereof, are superseded by this agreement. Furthermore, if there is a conflict of terms between this agreement and an order, this agreement will be the controlling document. S’well’s U.S. Reseller Terms and Conditions of Sale are hereby agreed to and acknowledged. If you are having any problems submitting your application, please email us at applications@swellbottle.com. Image Uploads: Image file size cannot exceed 3 megabytes. Images from your mobile phone may work best.